Miss Granite Worktops are a family-run business with over 25 years of experience in kitchen fitting, electrics, plumbing and building. We supply and fit granite, quartz and Dekton worktops within the Warwickshire/West Midlands area. We can cover other areas - please contact us if you live outside of the Midlands. 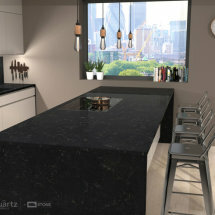 Our expertise is kitchens, and we work in conjunction with professional teams of quartz and granite kitchen worktop suppliers & installers who, as family businesses, have been in the industry and have been experts in their field for over 30 years. All of the products are fabricated on site in their purpose-built factories, using a combination of traditional masonry techniques with state-of-the-art CNC machinery. You can depend on us to deliver a professional service to you from start to finish. All work is carried out with the minimum of disruption to you as once the template is done, the quartz or granite is cut away from your home so there is no dust or noise involved at that point. As we don't have a showroom, we can keep our costs down and pass on the savings to our customers. 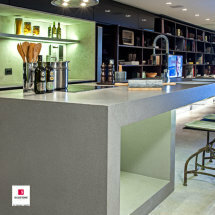 We can supply and fit a wide selection of granite, quartz and Dekton in stunning designs and colours. Whatever your requirement, we can help you choose exactly the right finish for your dream kitchen. If you live locally, we'll bring a selection of samples to your home and discuss your exciting kitchen plans with you. Why not mix and match colours to blend or contrast in your kitchen, perhaps white worktops and patterned quartz on an island for a contrast. Add a colourful splashback, or have one matching in the same quartz. The possibilities are endless. 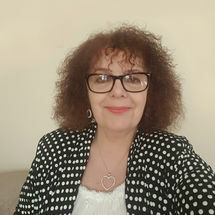 Tel: 0121 246 5765 or 07718176942 and speak to either Stella or Guy. If there's a particular quartz or granite you really like, we'll try and get it for you. We'll quote for your worktops FREE of charge with no obligation on your part. See our services. As we're an online business, we can keep our prices low, without compromising on expertise. Our sister company Kitchens InSynk Ltd are also based in Solihull and we design, supply and fit kitchens within the locality. We'll bring samples of kitchen unit doors and catalogues to you and chat about your kitchen project. Just call us for more info. We like our customers to be satisfied. The kitchen is the hub of family life, so why not enjoy your surroundings in luxury? Do your entertaining in comfort and style.